Poor attitude of staff. Air conditioning did not cool sufficiently. 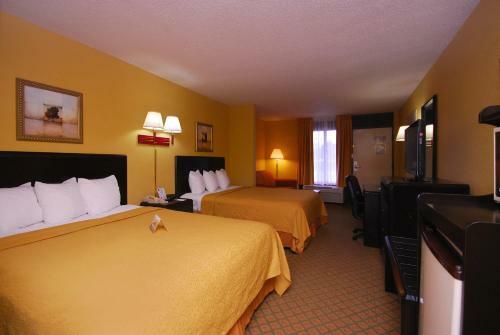 For airport travelers it is the ideal hotel/motel at great price and location if you have a car. Not in great walking neighborhood but easy freeway access. Many amenities for price, did not find elevator. Good location near airport, and free refrigerator. No decent eateries walking distance. Staff went out of their way to give directions, offer to drive us to restaurants for dinner, or to airport, to provide 1st floor room for aging parent (no elevator), etc. Clean rooms, decent continental breakfast including waffles and pancakes, wireless internet, very nice. Very helpful staff. Clean. All basic amenities. You can tell the building is older, but who cares? 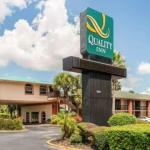 The 98-room Quality Inn Orlando Airport is two miles from the citys international airport and operates a free shuttle to that facility and to the Orlando Convention Center. Other items included with the room rate at this two-story motor inn are an expanded continental breakfast, high-speed Internet access, local telephone calls, a copy of USA Today and parking. There is one meeting room available for business or social functions that can accommodate 25 guests. The property is eight miles from downtown Orlando. Other area landmarks and attractions include Walt Disney World, Universal Studios, Sea World, the Florida Citrus Bowl, Amway Arena, home of the Orlando Magic basketball team and shopping at the Florida Mall. All of the rooms here are one-room suites and have a work area with Internet access, coffee maker, television with cable news and movie channels, microwave oven, mini-refrigerator, in-room safe, alarm clock, telephone with voicemail, iron and ironing board and a hairdryer. Handicap accessible rooms are available. This hotel has an outdoor seasonal swimming pool, whirlpool and an exercise room. The complimentary breakfast is the only meal served here. Restaurants nearby include a Bennigans, Chilis, Dennys, Tony Romas and a TGI Fridays. The 24-hour front desk has information on the Orlando attractions and events. Other amenities include a guest laundry, business center and ice and vending machines. This was the Days Inn and Suites at Orlando Airport. Then it was hard to find anyone who had anything good to say about the property. Now is have been revamped and become a Quality Inn it gets lots of glowing reviews. Clients say it is a great little hotel with reasonable rates and comfortable, clean accommodation. The employees here are efficient and friendly and have lots of helpful information about where to dine and shop. Most guests say they will return to the Quality Inn  something that nobody said when it was a Days Inn.